When people get to know me they realize I have four loves: my family, writing, travel and – of course! – food. I hope you’ll join me regularly for Terri’s Kitchen, and let me share some of the recipes that have been perfect for special times, family moments, or simply a quite rich treat! 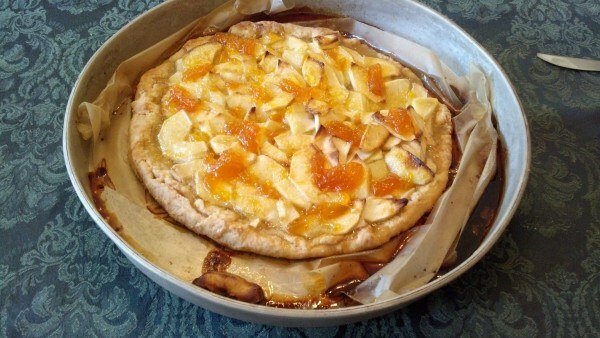 This week’s recipe is a wonderful recipe for apple tart. It’s easy to make and absolutely delicious! If you try this recipe, please do come back and let me know how you enjoyed it – maybe even send a picture for the Terri’s Kitchen Hall of Fame! You can also follow the Terri’s Kitchen Pinterest board. I made this apple tart for a recent lunch date with my lovely friend Ann Collette. I found the recipe on Epicurious.com, originally from the Barefoot Contessa. It is easy and fast and absolutely delish!